The L Wire: Pros outweigh the cons in new comedy drama "Orange is the New Black"
Over the past few years, TV viewing habits have shifted. Whereas people once waited patiently all week for the next episode of their favourite show, we now live in a world of “on demand” and “series record”; one that allows the viewer to dictate exactly when, where and what they want to watch. Even more recently, web-based media streaming sites such as Netflix and LoveFilm have started commissioning their own original shows; allowing them to deliver fresh and exclusive content straight to their subscribers. And with full series being uploaded at once, the wait for a weekly fix is all but over. Earlier this month, Netflix launched Orange is the New Black; a new series that has potential to become the latest lesbian fan-favourite. Part laugh-out-loud comedy, part heart-wrenching drama, full of on-point (verging on self-aware) references and with just the right pinch of the absurd, OITNB delivers a modern perspective of life in a women’s prison and is based on one woman’s real-life experience. The show stars Taylor Schilling (pictured below left) as Piper Chapman; a pretty, artisan soap-maker who shares a cosy middle-class existence with her fiancé, Larry (Jason Biggs, forever to be remembered as the teenager with a penchant for fruit-based pastries in American Pie). Their world is spun on its head when Piper’s past life as the girlfriend of an international drug smuggler comes back to haunt her and sees her sentenced to a year in Litchfield Federal Prison. 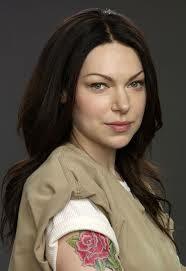 As it happens, that would be the very same prison in which Piper’s outrageously beautiful, drug-smuggling ex-girlfriend, Alex (Laura Prepon, pictured below right), also happens to reside. 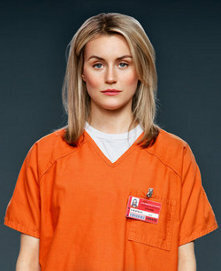 Whilst primarily set within the confines of Litchfield, episodes regularly flash back to the lives of Piper and her fellow inmates’ as they were pre-prison. These scenes give an often harrowing insight into the events in each woman’s life that led to her being locked up. The show also follows Larry, a writer, as he tries to adjust to his new life a prison widower. Flashbacks to Piper and Alex’s passionate past are definitely not the only references to lesbian life throughout the series, although, it must be said, they are definitely some of the hottest. You needn't worry about the show being slow burner either in this regard; a short but steamy shower scene 21 seconds in (not that I counted) sets the tone for the series. Thankfully, the majority of lesbianism portrayed seems natural, realistic and necessary to the plot rather than for shock-value or titillation. There is also a broad ensemble of gay women depicted; both in relation to where they fall on the butch/femme spectrum (if such a thing should exist) and also with regards to age, race and social background. Of course there are some stereotypes thrown in for good measure, but the fact they are not portrayed as “the only way to be gay” is certainly refreshing. Fans of But I’m a Cheerleader will be happy to see Natasha Lyonne play gay again, putting in an impressive turn as recovering drug-addict, Nicky Nichols. Another great bit of casting is that of transgender actress Laverne Cox as Sophia, a male-to-female trans person whose story is, at times, nothing short of heart-breaking. Some serious comic relief (with a huge side-portion of sympathy) comes in the form of Uzo Aduba’s depiction of Suzanne “Crazy Eyes” Warren, an inmate who wants nothing more than to make Piper her “prison wife”. It really is difficult to pick out a single favourite amongst what turns out to be a large and diverse cast of unforgettable, well-written and brilliantly performed characters. The goings-on in Litchfield are at times a little less than believable and there are a few classic prison clichés thrown in for good measure (nasty male prison guard, anyone?) but these certainly don’t detract from the show as a whole. Some viewers may take issue with the regularity of racial segregation and stereotyping throughout. These might best be explained as an attempt at irony by the writers, in order to challenge the very notions being portrayed. Undoubtedly prisons do often have a culture of cliques and gangs, but based the rest of the writing in the show, I very much doubt what was scripted is actually what the writers believe to be true. It would be interesting to hear other perspectives on this. Overall, OITNB is a brave show, both in terms of its dark content and colourful, often excellent, dialogue. Rated 18, it doesn’t shy away from the tough stuff. It could be argued that making a web-based series is advantageous in the sense that there are no fussy commercial networks or advertisers to appease. This seems to have allowed the creators to push the boundaries and make the show exactly how they wanted. And I for one am glad they made it exactly as they did; right down to theme-tune performed by the brilliant Regina Spektor. The only bad thing about an online TV binge is that once it’s done, it’s done. It’s like eating a massive chocolate cake in one sitting; yeah it seems like a great idea at the time and it tastes so good, but in the end you just end up feeling bad about yourself. Nobody wants to be a greedy, guilty, cake-less person, do they? In the two glorious days I spent watching Orange is the New Black, I fully immersed myself in the lives of some wonderful women I didn’t know a few days before. Now I genuinely care for them and am going to be a bit lost without them. Thankfully for me, Netflix have already commissioned a second season. In the meantime, I am trying to remind myself that patience, before the internet, was a virtue. 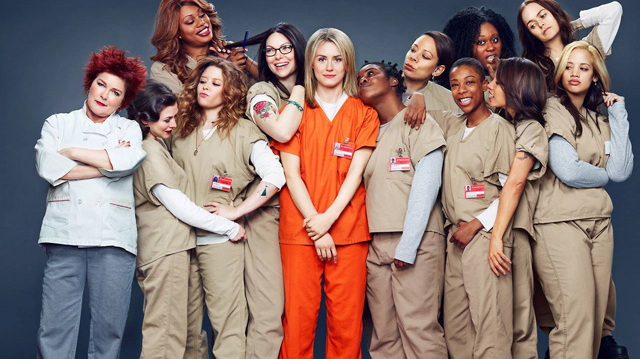 Have you already watched Orange is the New Black? Do you plan on watching it? Let us know your thoughts in the comments below!